A retelling of the events leading to the use of the Trojan Horse, to bring down the great city of Troy. THE CONQUEST OF MYCENAE (aka HERCULES AGAINST MOLOCH) is an Italian-French co-production (with an American star) that tells a standard "sword & sandal" tale of warring kingdoms in Ancient Greece, but beefs it up with some good plotting, epic battle scenes and a host of interesting characters played by a strong cast. Gordon Scott plays Glaucus, the prince of Tiryns, a powerful warrior who goes undercover in Mycenae to infiltrate the evil cult of Moloch, which is exacting tribute from neighboring kingdoms in the form of attractive young hostages, both male and female. Calling himself "Hercules," Glaucus defeats Mycenae's champions and gains the favor of the voluptuous Queen Demetra (Rosalba Neri) whose son, covered in a dog's head mask, has been raised as the living embodiment of the dark god Moloch and receives sacrifices in his sprawling underground grotto. Princess Medea (Alessandra Panaro), a proponent of a rival religion devoted to the Earth Goddess, makes contact with Glaucus and helps him set up an elaborate plan for opening the walled city's gates to an invasion by the army of Tiryns. The film is very nicely shot and designed, with some elaborate sets and beautiful costumes. The massive battle scenes that dominate the film's final half-hour, however, were lifted from an earlier movie, THE TROJAN HORSE (1961), from the same director, Giorgio Ferroni. American star Gordon Scott, better known for his portrayals of Tarzan in Hollywood films and Samson and Goliath in earlier Italian adventures, cuts quite a strong and heroic figure here, although his character never quite appears to be in much danger. (He's also dubbed by another actor.) If there is any flaw to the film, it is the overall lack of suspense and the rather mild shenanigans of the Moloch cult. 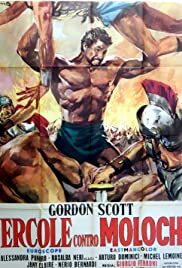 They don't really cause much carnage or do anything truly horrific enough to give this film the hard, brutal edge that other Italian muscleman epics boasted, most notably GOLIATH AND THE VAMPIRES (1961), which also starred Gordon Scott. The Italian supporting cast features some beautiful actresses, including Rosalba Neri and Alessandra Panaro. The always-reliable Arturo Dominici, a regular of Italian genre films, appears as the chief villain, Penthius, Mycenae's leading general, and makes a suitably formidable opponent for the hero. While the alternate title, HERCULES AGAINST MOLOCH (included in parentheses as part of the onscreen title of the print reviewed) is technically accurate in that a character named Hercules fights a character named Moloch, it's somewhat misleading given that Hercules is not the mythical strongman but the undercover name adopted by the hero, who never pretends to be the actual Hercules. The title of the U.S. DVD release is given on the DVD case as HERCULES VS. 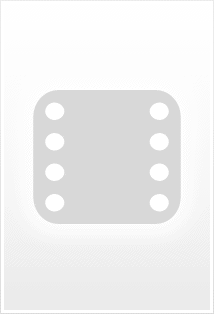 THE MOLOCH.